At the Macworld Expo in Boston, Steve Jobs announces that Apple and Microsoft have signed a five-year alliance. 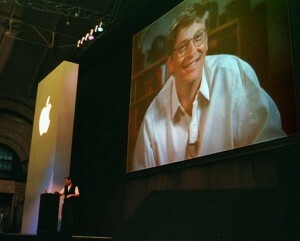 Bill Gates famously makes his seemingly ominous “big brother” appearance on the large presentation screen during the announcement. As part of the deal, Microsoft committed to continuing development of Microsoft Office for Mac over the next five years, Apple would make Internet Explorer the default web browser on the Mac, Apple and Microsoft would collaborate on Java compatibility, and Microsoft invested $150 million in Apple stock. However, the most important part of the arrangement is that both companies would cross-license all existing patents along with any new patents over the next five years, Apple would drop their long-running series of patent-infringement lawsuits against Microsoft, and Microsoft paid an undisclosed amount of money to Apple. The common assumption in the tech community is that Microsoft’s $150 million investment in Apple saved the company. However, the reality is that with Apple holding $1.2 billion in cash at the time, $150 million was a relatively small sum of money. Some now believe the undisclosed amount of money that Microsoft paid Apple was in fact a secret settlement to the patent-infringment claims. Estimated at anywhere between $500 million to $2 billion, this was the real meat of the “cross-licensing” arrangement. It was likely this much larger undisclosed amount, along with the show of confidence that Apple would be around at least another five years, that gave Apple and Steve Jobs the breathing room needed to reinvent Apple into the most valuable company in the world.